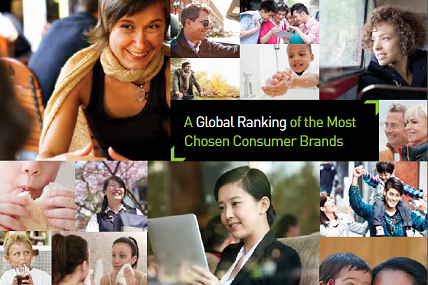 The first ranking of the most chosen global FMCG brands launched today by Kantar Worldpanel reveals the brands that are being bought by the most consumers, the most often. It highlights the opportunities for growth that exist, with only one brand in the world – Colgate – reaching more than half of the global population (65% penetration globally and 62% in Asia) with its oral care products. Colgate reaches 2 billion consumers in Asia by having excellent rural and urban distribution and by adapting to the local market with smaller pack sizes. Kantar Worldpanel’s Brand Footprint Ranking reveals the strength of brands in 32 countries (and four regions) around the world, across the food, beverage, health and beauty and homecare sectors. It uses an insightful new metric called Consumer Reach Points which measures – for the first time – how many households around the world are buying a brand (its penetration) and how often (the number of times shoppers acquire the brand). The unique calculation of penetration and frequency for this metric helps FMCG manufacturers to clearly understand their global reach in terms of actual basket reach and provides a vital guide on which regions present the biggest opportunities. The results suggest that global success doesn’t rely on being present in developed markets. Japanese cooking seasoning brand Ajinomoto (no 19 in global ranking) for example reaches virtually no households in Europe and only 2.6% in the US. Tang, the most likely new entrant into the ‘billionaire club’ (brands that reach over one billion consumers) with its powdered drinks, is popular in Asia and the fourth biggest global beverage brand despite only reaching 13% of households. As Asian shoppers become wealthier they are changing their cultural and shopping habits. Driven by an overwhelming need for convenience, the Western ‘ready meal’ culture is gaining a foothold in markets like China, The Philippines and Vietnam. Not ready to lose the home made taste people are still cooking at home but are using ingredients that save them time. Maggi is the sixth biggest brand globally and has 836 million of its 1.6 billion global Consumer Reach Points in Asia. There are 12 brands the reach more than a billion consumers in Asia including seven brands from Indonesia (Sedaap, Indomie, Masako, ABC Santos, Royco, Kapal Api and Frisian Flag), three from China (Master Kong, Mengniu and Yili) and two from India (Parle and Wheel). Marcy Kou, CEO Kantar Worldpanel Asia said: “Brands in the ranking all have a consistent brand offer across the region and have demonstrated their ability to understand and respond to local needs and build the best distribution networks that reach the most remote consumers in rural areas. However all of the brands still have plenty of room to recruit more shoppers in new geographies, new targets, new segments or on new occasions.